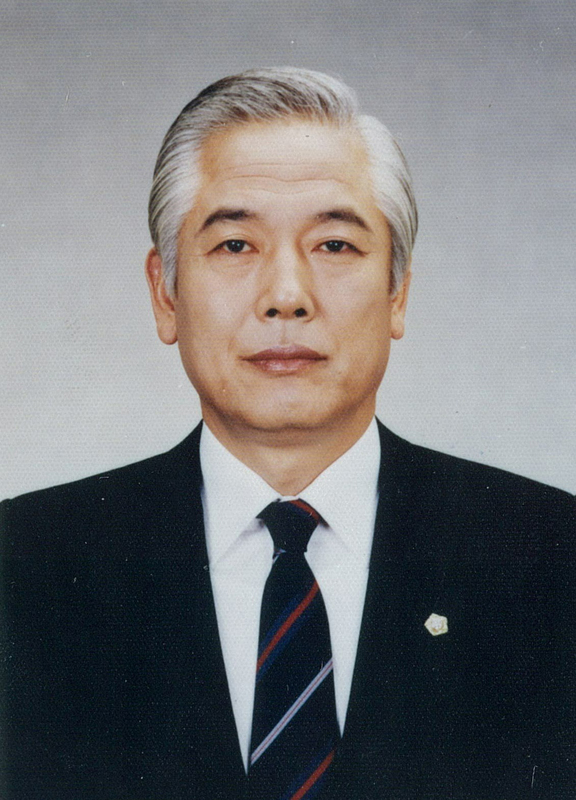 "I, as chairman of the SNU Alumni Associations, do not spare efforts to establish the nation’s top university’s prominent manpower into national leaders, who have excellent capabilities to give an insight into the national direction and rally people’s determination and will by humbly persuading them,” said Chairman Suh Jung-hwa of the Seoul National University (SNU) Alumni Associations. Pluralism and anti-authoritarianism, which have become the most important changes in the whole of society, including politics, economics and the cultural sector, are the valuable trends in democratic order of the current times, but they need to be in keeping with the stark reality of state and society, he added. Suh pointed out that some people’s assertion with sociological logics of foreign countries does not suit with the nation’s situation. As the former home affairs minister, Chairman Suh recalled that he had thought he could do many tasks with responsibilities he was entrusted with, but he realized humbly that any individuals couldn't do many things over a long period of time. He noted that leaders should be imbued with excellent intelligence and a humble attitude toward history and society. 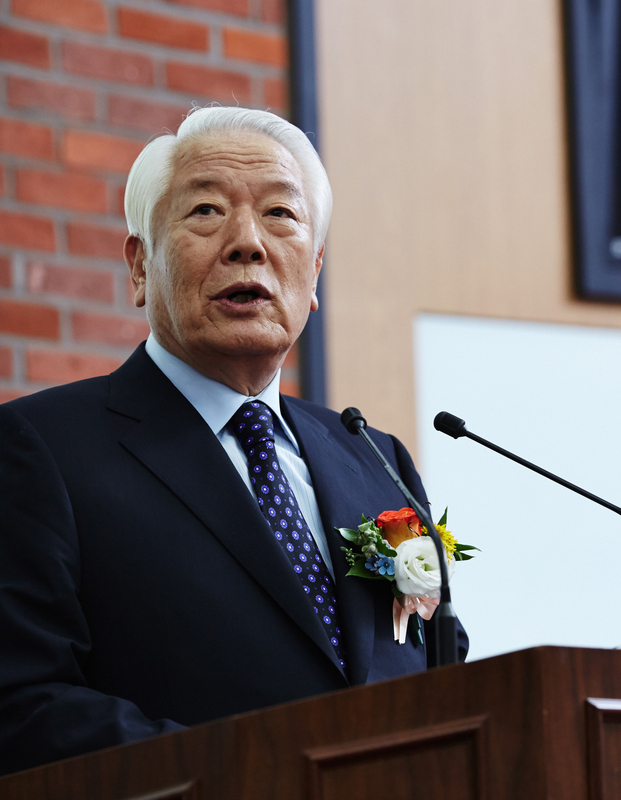 Chairman Suh has been credited with implementing many projects to develop his alma mater and country, including scholarship programs since he took office as the 25th chairman of the SNU Alumni Association last March. He served as minister of home affairs twice during the Chun Doo Hwan and Kim Young-sam governments. He was a five-term lawmaker from the 12th through 16th Assemblies. Suh’s eldest daughter is the wife of Hanwha Group Chairman Kim Seung-youn. The following are excerpts of an interview between NewsWorld and Chairman Suh of the SNU Alumni Association in which he spoke of his views on the development of SNU and country. Question: Will you tell our readers about the current status of the Seoul National University Alumni Associations? Answer: SNU alumni set up fraternity bodies according to each college of SNU in 1946, and each college alumni representatives assembled in 1968 to establish the Seoul National University Alumni Associations. The Seoul National University Alumni Associations, with a membership of some 350,000 alumni, has 25 college alumni bodies, four occupational chapters, 25 special alumni associations, 27 regional chapters and 53 overseas chapters. Out of the total, some 10,000 SNU alumni stay overseas, including 6,500 alumni in the United States, 1,000 in China and 500 in Japan. Q: Will you touch on your body’s activities in Korea and abroad? A: We publish some 100,000 copies of an alumni journal to boost smooth communication among alumni. The biannual journal that made its debut on April 24, 1976 changed into a monthly on April 13, 1980. We printed the 447th issue on June 15 without any interruptions. Starting with a New Year’s gathering to beef up solidarity with about 1,000 alumni attending, we hold regular events, including a regular general meeting, a golf competition, a go contest, a homecoming day, and diverse exhibitions to facilitate exchanges. The Gwanak Foundation, established on Dec. 15, 1978, offers scholarships to SNU students and research money to SNU faculty members, and conducts other support projects. A total of 7,030 alumni chipped in 45.2184 billion won and dedicated an 18-floor building with six basement floors in Dowha-dong, Mapo-gu, Seoul, in 2011 as financial assets to secure scholarships and research money. We’ve just launched a project to establish a global network of overseas alumni. The SNU Alumni Association in Japan was created in 2014 by consolidating the Tokyo and Osaka chapters, while the SNU Alumni Association in China was established by merging the Beijing and Shanghai chapters. We plan to create alumni associations in major countries for the establishment of a global network designed not only to lay a foundation for mutual assistance among alumni, but also to develop it into an elite group capable of yielding clout for the development of Korea and unification. Q: Will you speak about the current status of scholarships for SNU students and future plan? A: Starting with the offering of scholarships to 13 SNU students on March 4, 1980, the Seoul National University Alumni Associations has so far provided 15.7 billion won in scholarships to 7,252 students through the first semester of 2015. During 2015, we plan to provide 3 billion won in scholarships to a combined 840 students, representing a 1.8-fold jump over the provision of 1.7 billion won to 589 scholarship recipients in 2013 before I took office. North Korea. The scholarships for the first semester of 2015 surged 30 percent over the same semester of the previous year thanks to special alumni contributions. We plan to embark on the so-called Relationship Scholarship Program, a kind of one-on-one mentoring project connecting alumni and students, and offering whole personal support ranging from scholarships to living cost support and mentoring services. Currently, mid-level or higher public office holders, CEOs and executives in their 50s, public entity executives and division heads, and professional personnel have been selected as mentors. Beneficiaries of the Relationship Scholarship Program are classified into categories of prospective career and care. Besides, we plan to initiate the Grass Roots Scholarship Program, a campaign to raise scholarships from former scholarship recipients in order to inherit the spirit of loving their alma mater and sharing love. We’re going to raise between 300,000 won and 1 million won during the year from each of the former 7,252 scholarship recipients. The scholarship money, to be raised under the program, will be combined with a budget from the SNU Alumni Associations to dole out to 100 select students a kind of study scholarship corresponding to study materials costs and living costs. We expect these programs to establish a tradition of transferring benefits from senior alumni to juniors and the culture of contributing. Q: What major activities do you want to implement in your mind? The SNU Alumni Associations launched the 120-year SNU historical compilation project in 2014 to establish the history of SNU and declare SNU members’ inherited values. The project is designed to trace the historical origin of SNU before the effectuation of the act on the establishment of SNU and unearth the values SNU members have to inherit. Our ancestors had devoted themselves to establishing a higher education institution to realize the dream of our brethren’s national independence, and our heritage has led us to the national fruits of SNU without interruption, even during the dark days of Japanese colonial rule. I’m sure that the historical compilation project, to be completed by the end of 2015, will manifest the historical origin of SNU and values. We plan to raise 10 billion won to build an SNU memorial hall like world-class universities, which have their own memorial facilities. The planned space will be used for declaring the history of the university, inherited values and future vision inside and outside the campus, but unfortunately there is now no such facility at SNU. The planned SNU memorial hall will display such themes as achievements for the motherland, scholastic feats and changes to campus life. Chairman Suh Jung-hwa of the Seoul National University Alumni Associations delivers a speech at a meeting of the SNU Alumni Associations. The SNU Alumni Associations endeavors to expand its capabilities and outside reach. Since I was inaugurated, we have successfully located an additional 100,000 alumni who had lost contact, and we plan to find the remaining 150,000 “no show” alumni with unknown whereabouts . We plan to dramatically reinvent the alumni journal to improve communication channels between the alma mater and alumni, among alumni, and between alumni and students. The SNU Alumni Associations plans to establish a committee of 100 prominent SNU alumni. There are many gifted SNU alumni demonstrating excellent capabilities around the world, but they tend to be separated and isolated compared to other university alumni. We intend to evolve the committee into a global elite group supporting the alma mater and its students’ studies, and conducing diverse activities, including assisting national policies in all directions. We plan to further cement organizational relations among SNU alumni groups in Korea and overseas, as well as systemize a network of alumni associations. Chairman Suh of the SNU Alumni Associations explains his organization’s activities in Korea and abroad during an interview with NewsWorld. We strive to do our utmost to provide support to enhance our alma mater’s education and research capabilities by making the most of the values and capabilities SNU has established and ramped up. SNU leads the nation’s manpower development and research development as the nation’s top educational institution, but the university is a far cry from being up to a par with the best universities in the world. We need prominent manpower, armed with intellectual insight for creative innovation and historical minds, who will humbly devote themselves to the development of their alma mater and nation. In this regard, the success or failure of today’s SNU will determine the destiny of Korea’s next decade. The SNU Alumni Associations strives to prove full support to SNU’s lead in advanced science and knowledge study and core technology development to overcome the nation’s limit of failing to nurture Nobel laureates. We also do not spare efforts to provide omnidirectional support to nurture globally renowned manpower in all sectors of society, including the financial, management and diplomatic fields. SNU will also continue to offer an open lecture program, a project of sharing prominent scholastic achievements with both the general public and students around the world. To this end, the SNU Alumni Associations finances a scholarship study support project worth 7 billion won under contract with SNU, which boasts of leadership in sharing advanced knowledge and is committed to fulfilling its social responsibility. To be respected by the global community, Korea needs to demonstrate to the world the capabilities and dignity corresponding to the standing of one of the advanced countries. In this regard, the SNU Alumni Associations will devote itself to nurturing future global leaders. I’m confident the grandeur project may be achieved for the development of our alma mater and state with the determination and support of 350,000 alumni. Chairman Suh of the SNU Alumni Associations has an interview with NewsWorld editorial staff, including NewsWorld President & Pulbisher Elizabeth M. Oh.